Search for all "Collagen type V"
Mouse anti Human, Rabbit, Rat Collagen type V V-3C9. Product is tested for Enzyme Immunoassay, Frozen Sections, Western blot / Immunoblot, Paraffin Sections. 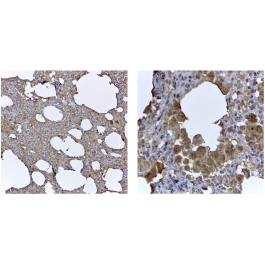 Immunohistochemistry on Frozen and Paraffin Sections: 1-10 µg/ml. PLP fixation is required, antigen retrieval is HIER. Not recommended for traditional formalin fixation. Acetone fixation can also be used. Collagens are highly conserved throughout evolution and are characterized by an uninterrupted "Glycine-X-Y" triplet repeat that is a necessary part of the triple helical structure. Type V Collagen is a member of group I Collagen (fibrillar forming collagen). It is a minor connective tissue component of nearly ubiquitous distribution. Type V Collagen binds to DNA, heparan sulfate, Thrombospondin, Heparin, and Insulin. Collagen V is composed of several subunits as follows: trimers of two alpha 1(V) and one alpha 2(V) chains in most tissues and trimers of one alpha 1(V), one alpha 2(V), and one alpha 3(V) chains in placenta. Type V Collagen is closely related to type XI Collagen and it is possible that the Collagen chains of types V and XI constitute a single collagen type with tissue specific chain combinations. Mutations in this gene are associated with Ehlers Danlos syndrome, types I and II. Mayne R, Zettergren JG, Mayne PM, Bedwell NW. Isolation and partial characterization of basement membrane-like collagens from bovine thoracic aorta. Artery. 1980;7(4):262-80. PubMed PMID: 7213017. Niyibizi C, Fietzek PP, van der Rest M. Human placenta type V collagens. Evidence for the existence of an alpha 1(V) alpha 2(V) alpha 3(V) collagen molecule. J Biol Chem. 1984 Nov 25;259(22):14170-4. PubMed PMID: 6501291. The antibody specifically reacts with hCL(V) (Human Collagen type V) and cross-reacts with Rabbit and Rat CL(V). It recognizes the Collagen alpha-1(V) chain.